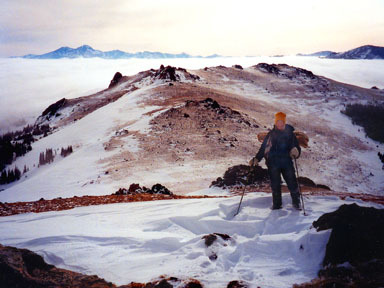 These summits are above the long Bulwark Ridge, which rises above the North Inlet. 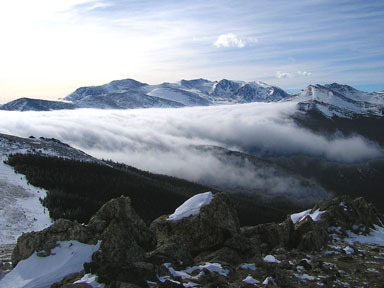 The peaks are outliers on the northeast edge of the Mummy Range and Rocky Mountain National Park. 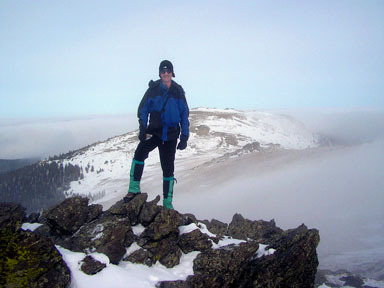 These gentle summits can provide an avalanche-safe winter outing. These photos were taken on 2/06/05. Most of this hike is a Class 1 trail walk, which is capped with a short, Class 2 scamper to the summit of South Signal Mountain. 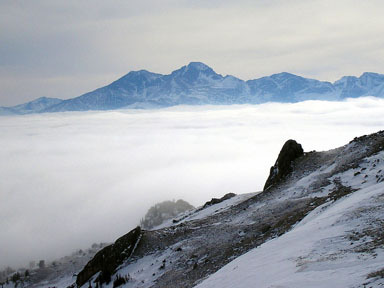 You can reach the summit of the higher Signal Mountain with Class 1 hiking. Start at the North Inlet Trailhead, pass the vehicle gate, and walk 0.6 mile northwest up the continuing road to a saddle at 8,100 feet. Leave the road here, and hike north onto the beginning of the Bulwark Ridge Trail. Hike 0.8 mile north on the trail as it switchbacks up onto Bulwark Ridge, and reach a signed trail junction at 8,700 feet. Continue straight on the Bulwark Ridge Trail for 3.3 miles until it crests at 10,840 feet near the summit of Bulwark Ridge. At this point, you will be in the Comanche Peak Wilderness, and will be able to see the Signal Peaks ahead of you. Descend 0.25 mile to the gentle, 10,780-foot saddle between Bulwark Ridge and South Signal Mountain. 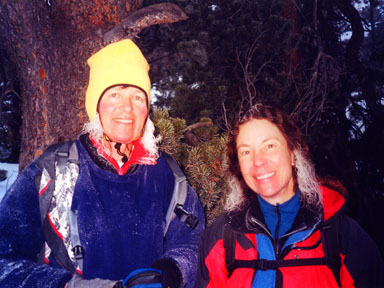 Continue another 0.25 mile north-northwest on the trail to treeline at 11,000 feet, where your long, 5.2-mile approach through the trees is finally over. Only the summit ride remains. Leave the trail at treeline, and hike 0.2 mile up gentle slopes to the summit area of South Signal Mountain. 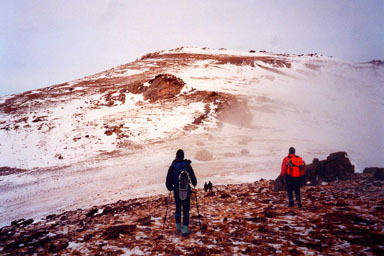 The conventional summit is an interesting rocky outcrop in the center of the summit area. Scamper up it on its north side (Class 2). There is a second rock outcrop 100 yards to the west, which is very close in height, and purists will want to visit that summit as well. From this summit area, you will have expansive views into the often hidden northeast reaches of Rocky Mountain National Park. The boundary of the park near here changed, and the 1962 Pingree Park Quadrangle shows the old boundary. 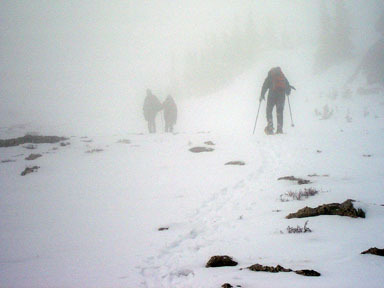 The new boundary touches the central summit of South Signal Mountain, then runs west along the ridge connecting the Signal Peaks to the Stormy Peaks. To continue your tour, descend 0.5 mile northeast on gentle terrain to an 11,020-foot saddle, then hike 0.2 mile northeast to the summit of Signal Mountain. This suspended summit just misses being in the park, but it is in the Comanche Peak Wilderness, and it is the easternmost Elevener in the Rocky Mountain Park region. 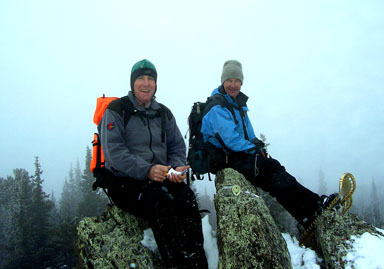 For your descent, return to the Signal-South Signal saddle and the Bulwark Ridge Trail. Either coming or going, take the time to scamper up to the rocky summit of Bulwark Ridge, which is 100 yards north of the trail.